A total of 11 fighters from this past weekend’s UFC 99 event in Colonge, Germany will be suspended for various injuries sustained during their fights. 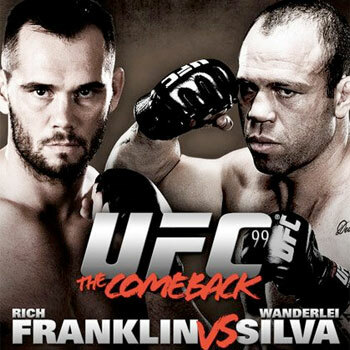 Headliner Rich Franklin will require x-rays on his left foot before he can return to action. The Association of Boxing Commission’s official record keeping database, which is located on mixedmartialarts.com, released the list of suspensions on Wednesday. If a doctor does not give Franklin the go-ahead, he will be riding the pine until December 5th. He faces a minimum suspension until July 14th, with no contact allowed until July 5th. Rick Story: Suspended until July 14th, with no contact allowed until July 5th. Stefan Struve: Suspended until August 13th, with no contact allowed until July 29th. Paul Taylor: Suspended until July 14th, with no contact allowed until July 5th. Dale Hartt: Needs an X-Ray and MRI on his left shoulder and a CT scan of his right orbit. If he’s not cleared by a doctor, he’ll be out until December 5th. Minimum suspension until August 13th, with no contact allowed until July 29th. Terry Etim: Needs X-Ray on nose and needs to be cleared by doctor, otherwise he’s out until December 5th. Minimum suspension until August 13th, with no contact allowed until July 29th. Marcus Davis: Needs X-Ray on nose and face and needs to be cleared by doctor, otherwise he’s sidelined until December 5th. Minimum suspension until August 13th, with no contact allowed until July 29th. Mike Swick: Needs X-Ray on right hand and needs to be cleared by a doctor, otherwise he’s sitting through December 5th. Minimum suspension until July 14th, with no contact allowed until July 5th. Mustapha al-Turk: Needs his left eye checked and cleared by an ophthalmologist, otherwise he’s out through December 5th. Minimum suspension until July 29th, with no contact allowed until July 14th. Cheick Kongo: Suspended until July 29th. With no contact until July 14th. Cain Velasquez: Suspended until July 14th, with no contact until July 14th.